A hiking app allows you to easily navigate along the trails and quickly find the best route to your destination. Furthermore, hiking apps can also track your hikes and show you details about each hike such as the duration, distance, ascent, decent etc. Some hiking apps come with preloaded trails so that you can easily find hikes near your location. We have mostly been using the Suunto Ambit 2 watch for navigation on our hikes, but we decided to try out the so-called hiking apps. 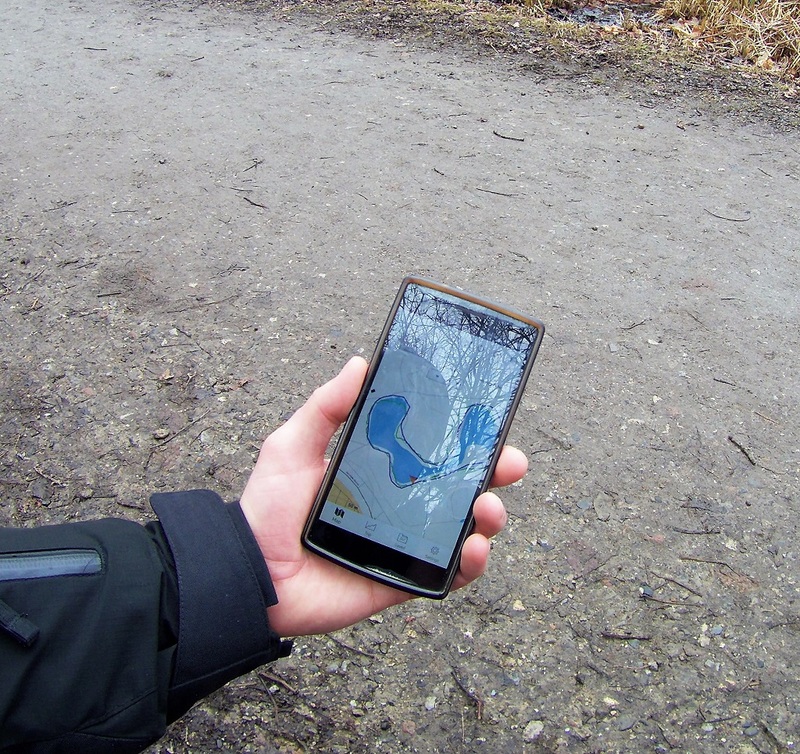 For the last couple of weeks, we have been testing the 8 top-rated hiking apps on Google Play. From those we choose the best five and reviewed them here. We only tested hiking apps that come for free and are available for the Android operating system. However, many of these apps are also available for iOS (see the table below), but since we don’t have any iOS device, we only tested them on an Android device. What features did we consider as mandatory? In our opinion every hiking app should provide GPS navigation and GPS tracking. By GPS navigation we mean that the app can show your current location and direction on a map and supports import of GPS tracks. GPS tracks are very useful for hiking because it is easy to get them online and they make navigation during hikes easier. 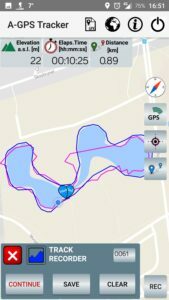 To learn more about GPS tracks check out our article What are GPS tracks and how to use them for hiking. When it comes to maps, we were not picky, but we did indeed consider offline maps and/or topographic maps as a benefit. 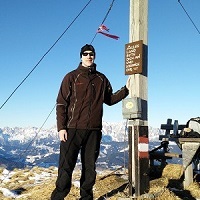 We also thought that a hiking app should provide you with some information about your hikes. For example, duration, total distance, total ascent, total descent, lowest point, highest point etc. Furthermore, it should also show where you hiked on a map. Note: You might ask yourself why we are so focused on GPS tracks. It is simply because we use them all the time. For example, if we travel to France and want to climb some mountain, we check if there is any GPS track for that mountain available online – and there usually is. This drastically reduces the time we need to plan our trips. We were testing features, accuracy, ease of use and battery consumption. 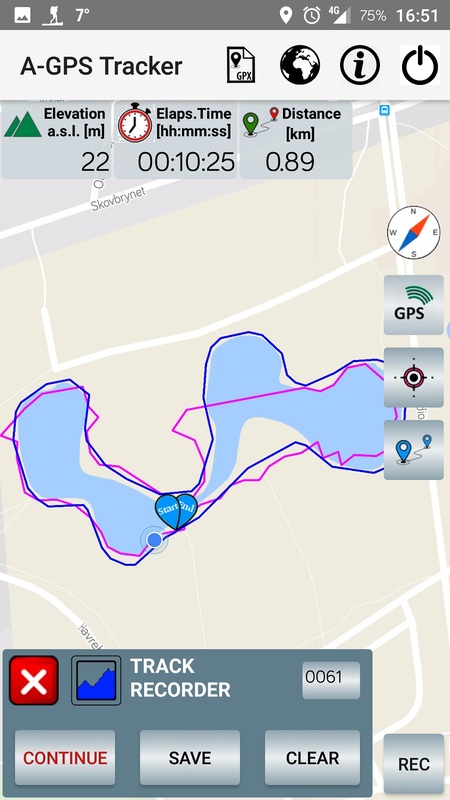 We tested the navigation functionality by creating a valid GPX route in Suunto Movescount and importing it to each app. For the testing a OnePlus One Android device was used to ensure that all apps also work on older devices. We tested each app on the same short trail and carefully noted down pros and cons. Note that we only tested free features – for example some apps offer offline maps, but you need to purchase them. In such case, we marked this feature as non-existent. The following eight apps made it into our initial selection: Map My Hike, AllTrails, Komoot, Hiking Project, Gaia GPS, Green Tracks, A-GPS Tracker and AlpineQuest GPS Hiking Lite. The five best hiking apps were AllTrails, Komoot, Gaia GPS, A-GPS Tracker and Green tracks. The Hiking Project app did not qualify because it does not support GPS tracks and therefore you cannot plan a route for your hike beforehand. The Map My Hike app didn’t make it either, because it only supports road maps and thus it seems more oriented towards those who like to walk within cities. Lastly, we dismissed the AlpineQuest GPS Hiking Lite because the free version does not support GPS tracking. You should never rely solely on your smartphone (regardless of hiking app) because its functionality is limited by battery life and availability of GPS signal. Instead, it is recommended that you always, when you are hiking in unfamiliar terrain, also bring a compass and an appropriate topographic map. During the brief overview of the hiking apps that made it into our initial selection, we never thought that the Green Tracks app would rank on the first place – the app stood out by its graphic design and not in a positive way. However, after carefully testing the app we figured out that it is very easy to use. 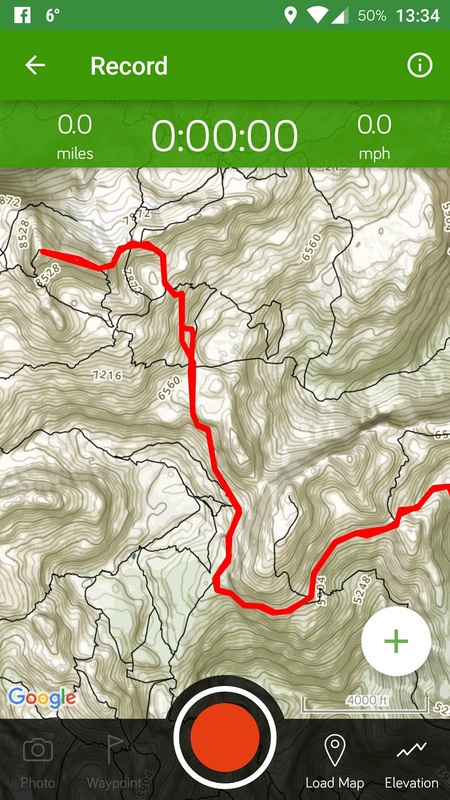 Furthermore, it is also the only hiking app that comes with an enormous amount of free offline topographic maps. Keep in mind that GSM signal is not always available in remote or mountainous regions and thus offline maps are indeed a very useful feature. 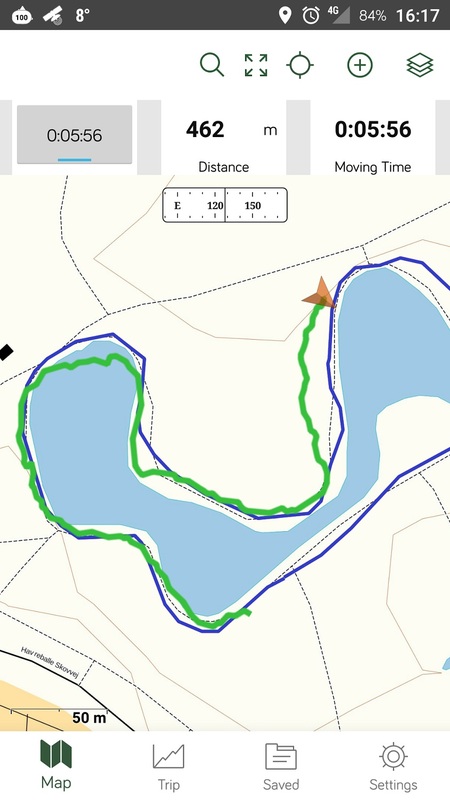 The Green Tracks hiking app also offers no less than 11 types of online maps (road, satellite and topographic etc.) and shows a lot of live data about your hike (ascent, distance, elevation graph etc.). To use GPS tracks you need to transfer them to your smartphone storage (via cable, Google Drive, email etc.) and open them with the app. What we didn’t like about this app was that if you touch the map, it stops updating your location until you press the re-center button again. Hopefully, the developers will fix this bug soon. The Gaia GPS hiking app impressed us with live data while we were hiking – no other app in this review shows you so much information about your hike (speed graph, elevation graph, highest point and all other kinds of important information). 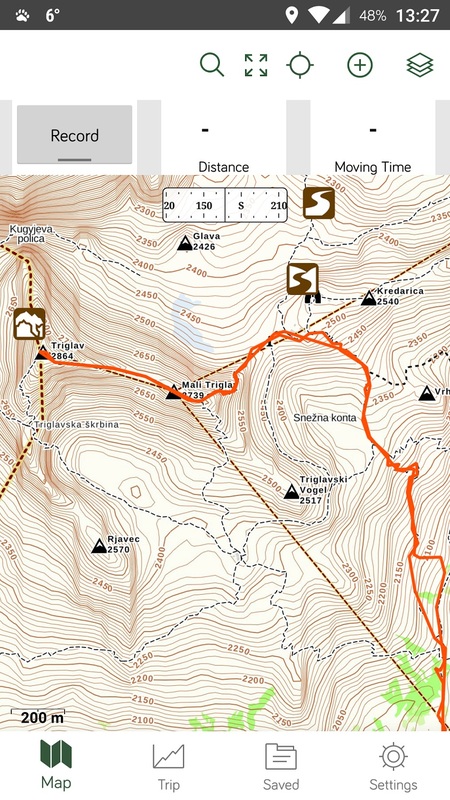 The app is also very easy to use and comes with a great topographic map. Furthermore, the Gaia GPS app supports satellite map and road map. However, these maps don’t work if you are not connected to the internet (free version) which is indeed a downside. You can easily use GPS tracks with the app – you simply transfer them to your smartphone storage and open them with the app. 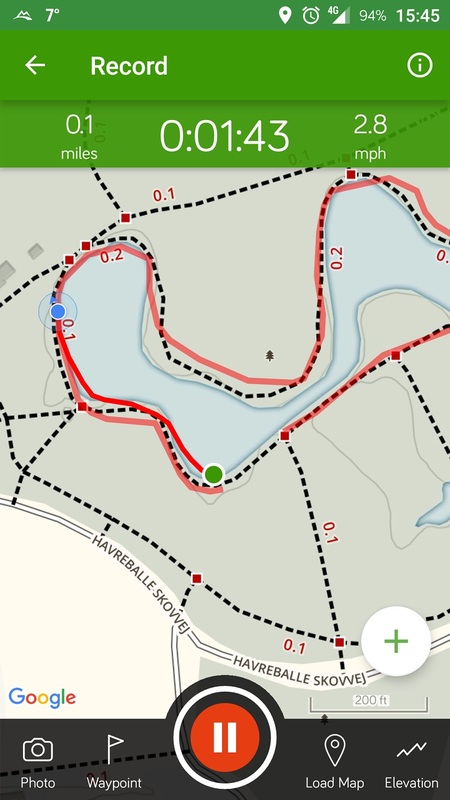 While you are hiking the app also draws a breadcrumb trail on the map (note: all apps in this selection have this feature). We recommend Gaia GPS hiking app to those who find the design of the Green Tracks app outdated or have an iOS device (the Green Tracks app is not available for iOS). The Gaia GPS app, has the best topographic map of all apps reviewed here. The AllTrails hiking app has a good interface and comes with road, satellite and topographic map like the Gaia GPS app mentioned above. However, the AllTrails app provides you with much less information about your hike than the Gaia GPS app and has a less sophisticated topographic map. Besides from that, it is relatively easy to use and even comes with preloaded trails which will unfortunately only work if you are connected to the internet. The app also keeps track of your activities and shows you how much you hiked each month. Getting GPS tracks to the app was quite a hassle – definitely more complicated than with the other hiking apps in this selection. 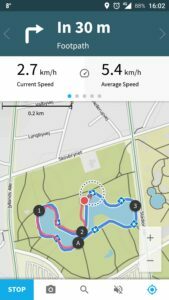 Here is a guide on how to use GPS tracks with the app. We also didn’t figure out how to export GPS tracks from the app. The Komoot app wins when it comes to graphic design and interface. The app is very easy to use and comes with several very useful features. One such feature is turn-by-turn voice navigation – yes, even on hiking trails! Furthermore, the app also calculates the optimal route to your destination for you; if you tap on a point on the map, the app will create you the optimal route to that point. The Komoot app also keeps track of your activities and allows you to connect with other hikers around the world. A letdown is that the app only comes with a topographic map which can’t be zoomed in adequately. We would thus like to see that more types of maps were available. Besides from that, the Komoot app is a great option for hikers, trekkers and backpackers. It also allows you to easily import a GPS track via the Komoot website. 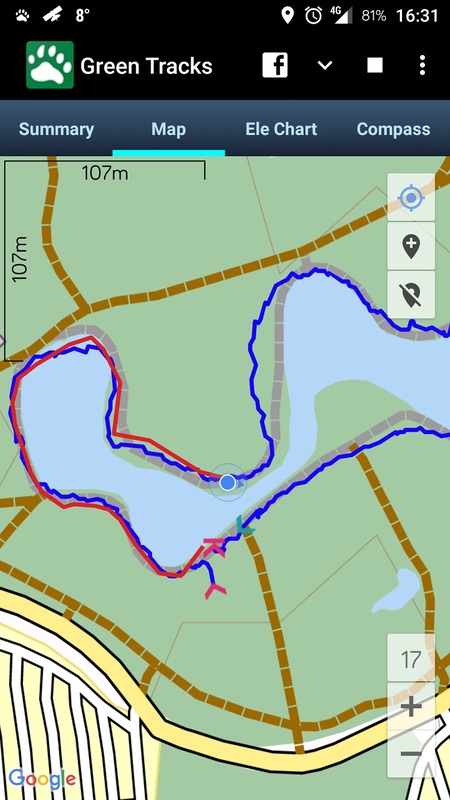 The A-GPS Tracker hiking app seemed like a less sophisticated version of the Green Tracks app. The app is thus easy to use and allows you to import GPS tracks without a hassle – you just transfer them to your smartphone and open them with the app. However, the A-GPS Tracker app does unfortunately not support topographic maps and we were also a bit disappointed with the tracking accuracy (see the image on the right). It also shows less information about your hike than the other apps in this review. Nevertheless, it is a good option for those who want a simple and lightweight navigation app for their trips. According to the AccuBattery app, all the tested apps, besides from the A-GPS Tracker app, consumed approximately the same amount of energy. The A-GPS Tracker app consumed much less battery but on the other hand the GPS tracking was also quite inaccurate in this hiking app. 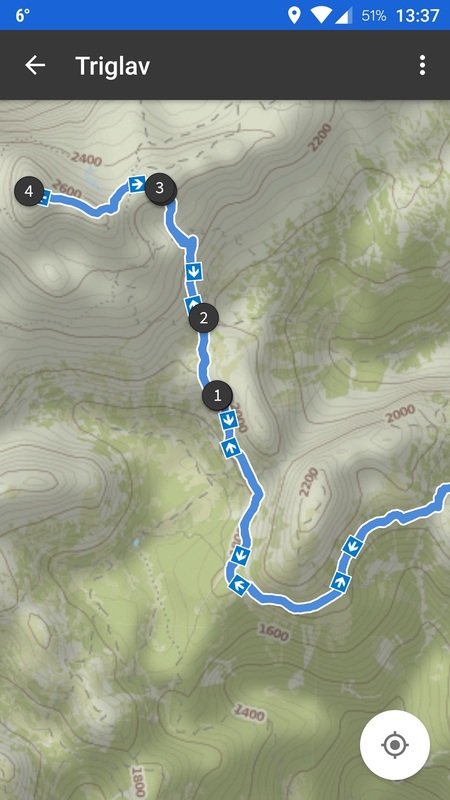 The Gaia GPS and Green Tracks apps have the best topographic maps. 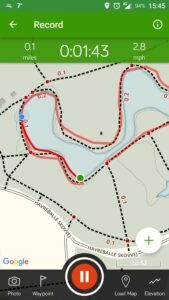 The A-GPS Tracker app does not support a topographic map. Only the Green Tracks app has free offline maps. Below we made a screenshot of our GPS track from Triglav hike rendered in each app so that you can assess the quality of maps yourself. We used a topographic map, if the app could provide it. We must admit that these apps are very useful for hiking, but we will probably only use them as a backup on our hiking trips. We will keep using the Suunto Ambit 2 watch for tracking and navigation (in addition to a compass and a map), because it is much easier to use than a smartphone – especially in rainy and cold weather. Also note that smartphones cannot compare to handheld GPS devices or GPS watches when it comes to battery life and durability. What is your experience with hiking apps? Did we forget any good hiking app? Let us know in the comments below. Thank you Blaz for this review!!! 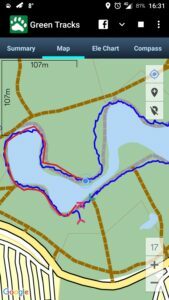 Is there any app for phones/tablets able to receive GPS data from the watch (Suunto, Garmin) and handle maps, waypoints and routes? I mean, just to see bigger and with more details what you can see in the watch…. Not that I would know. You need to manually export a GPS track and import it to a phone app. 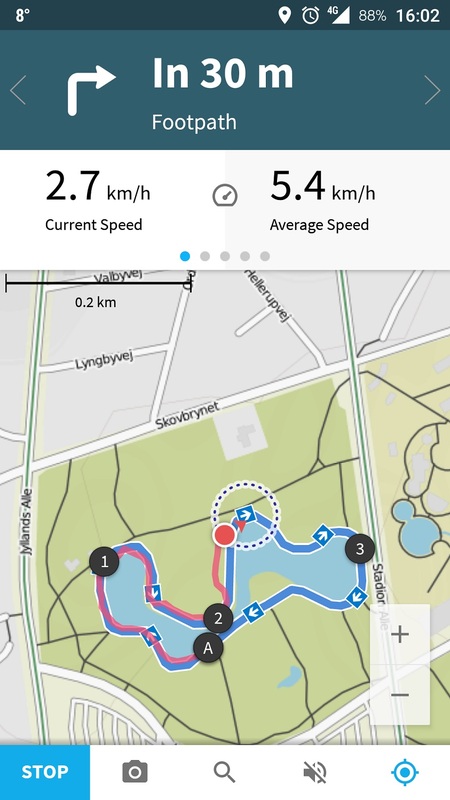 However, the new Suunto app keeps routes in sync with the watch, but it doesn’t provide navigation. Well, there is a trick – if you click on edit route in the app, the app starts showing your location as well as the route 🙂 So, theoretically it possible to use it for navigation.